To address the large amount of consumers with low-powered laptops or older computers, Nvidia has announced GeForce Now, a game streaming service that follows in the footsteps of existing services such as PlayStation Now and OnLive. 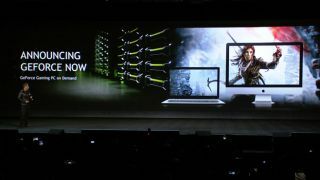 At its keynote at CES 2017, Nvidia showed off the new service by showing Rise of the Tomb Raider, a PC-exclusive, running on a Mac. The service means that not only will customers be able to play games that wouldn't normally run on their system, but games will also download quickly to the cloud-based service. This is not the first time Nvidia has tried its hand at game streaming, but the new GeForce Now is pretty different from its previous incarnation. Previously the service was exclusive to Nvidia's own hardware, and was limited to a small number of games, which you would subscribe to on a monthly, unlimited, basis. In contrast, the new service is available on conventional desktops and laptops, and is able to play any game available through Steam or other gaming stores. The service will be available starting from March 2017, and will cost $25 for 20 hours of play on a GTX 1060 machine, or 10 hours on a GTX 1080 machine. Check out all the latest news from CES 2017.